Following last night’s departure of EastEnders actress Rita Simons, the camp-members were rewarded with snacks, drinks and karaoke. 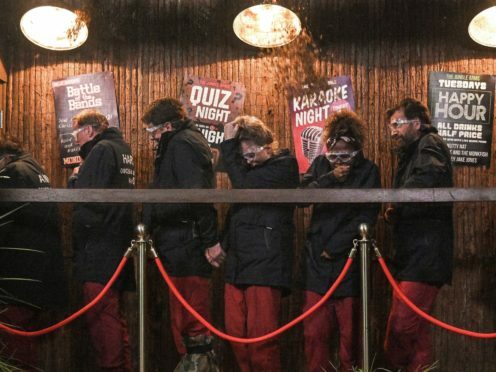 Forming a queue outside, the celebrities had to approach one by one before being confronted by the doorman, Kiosk Kev. They were challenged to answer his question. If answered wrong, the contestant would have to return to the back of the queue. The former football manager and Emily Atack were the last to gain entry after Redknapp answered wrong and Atack was caught cheating, after Redknapp shouted the correct answer to her question. After the group had all gained entry, festivities began. Fleur East and James McVey sang and strummed a guitar before Redknapp stood to deliver a rousing rendition of Paul Anka’s My Way, made popular by Frank Sinatra. Barrowman and Atack took on Summer Nights from the musical Grease while Anne Hegerty sang Mamma Mia by ABBA. 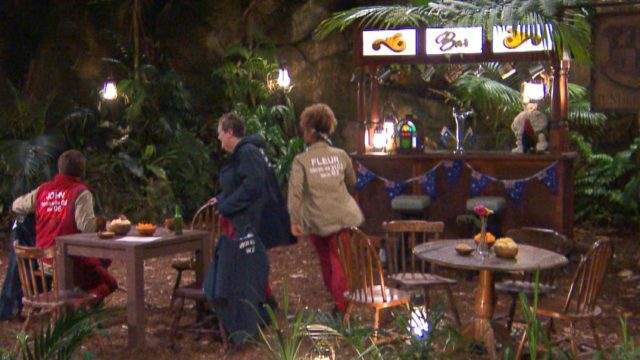 One more celebrity will leave the jungle tonight, following Simons, Noel Edmonds, Malique Thompson-Dwyer and Sair Khan.